. The new version of Google Analytics is currently available in beta to a number of Analytics users. We’ll be giving access to even more users soon. Sign up for early access. And follow Google Analytics on Twitter for the latest updates. Real Analytics ninjas use goals. Google Analytics has always had URL Goals (when a visitor reaches a specific page). In 2009, we added Engagement Goals to track success metrics around visit depth and time on site. 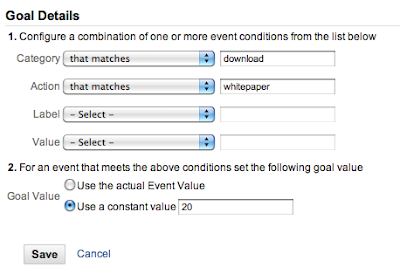 With the new version of Google Analytics, we’ve added one more: Event Goals. This was one of our most requested features, and it gives you even more reason to use event tracking. These interactions all have potential business impact, but until now you couldn’t track them as goals in Google Analytics. Let’s look at three ways you might use Event Goals on your site. Suppose you run a business to business (B2B) website and offer whitepapers (as a PDF download) in order to attract leads. You drive traffic to this page through advertising. You can track the number of downloads using event tracking. For example, we can use the category to designate the click was of type “download”. We can use the action to designate the download was a “whitepaper” and we can use the label to identify the actual whitepaper that was downloaded. With the new Google Analytics, configuring this as a goal is easy. We simply match any event with the category of “download” and the action of “whitepaper”. Finally we set the goal value as 20. With Event Goals, you can now set up a goal based on this value. In this example, we’ve configured a goal when a user spends over 180 seconds watching the product demo. Traditionally, the only way to set goal values was when creating the goal in Google Analytics, or from the tracking code using ecommerce tracking. With Event Goals, you have another option: using the event value as the goal value. 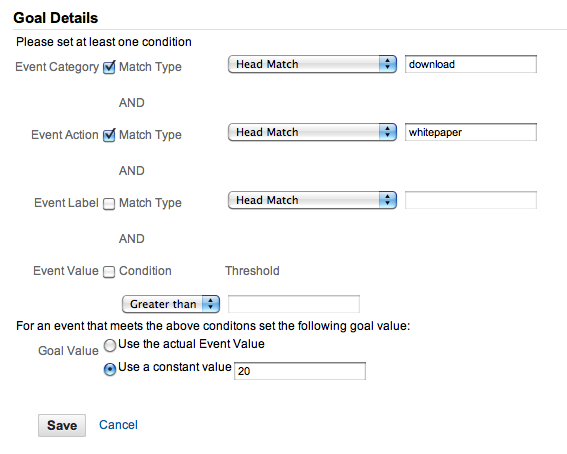 Now when a goal is matched, the value passed in the event will be used as the goal value. 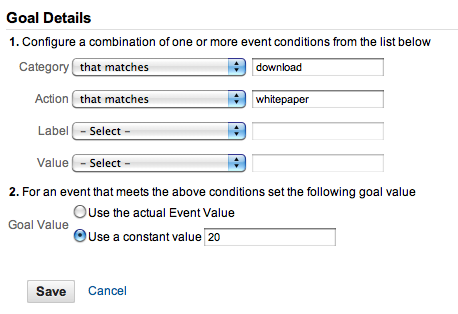 These are just a few examples of how you can take advantage of Event Goals in the new Google Analytics. You can read more on how to implement Event Tracking on Google Code and how to set up goals in the new Analytics. We’re constantly giving more of you access to the new version. If you don’t have the new version yet, you can sign up for earlier access. Update: 4/10/2011: 2:15pm PST - Screenshots updated to match recent updates to event goal configuration. This is part of our series of posts highlighting the new Google Analytics. The new version of Google Analytics is currently available in beta to a number of Analytics users. We’ll be giving access to even more users soon. Sign up for early access. And follow Google Analytics on Twitter for the latest updates.